The next step is the submission of a New Drug Application (NDA) to the FDA during the latter half of this year--with the hope of drug approval sometime in 2012." So what does this mean? Is VX-770 a cure? To understand what VX-770 does, we have to step back and do a little CF cell biology--and I promise I won't get too technical. People with CF have two copies of faulty instructions in their genes. These faulty instructions tell mucus-producing cells to make the CFTR protein incorrectly. 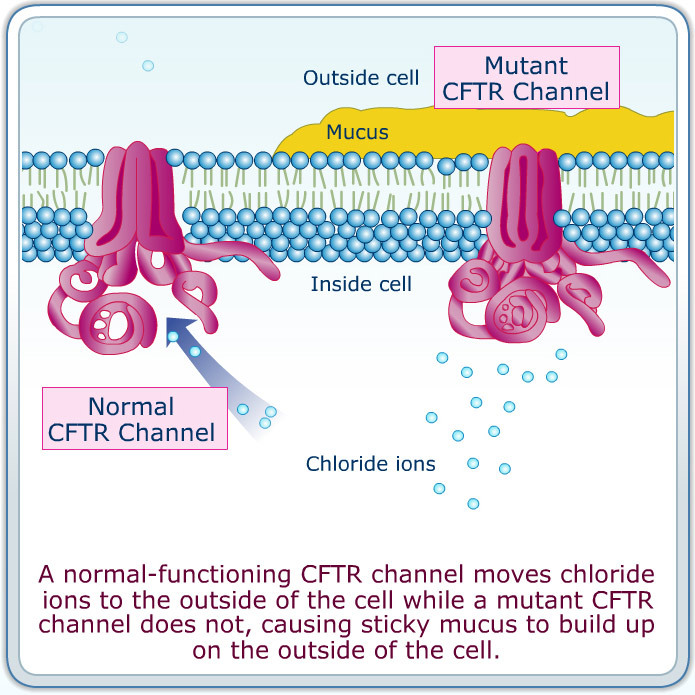 The normal CFTR protein goes up into the cell membrane and acts as a gateway. It lets chloride (salt) and water pass through, thus producing thin, slippery mucus that lines our lungs, sinuses, digestive organs, etc. 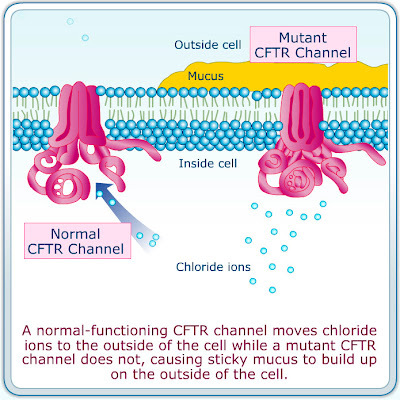 When the CFTR protein is made incorrectly, the gateway doesn't function, and so people with CF produce thick, sticky mucus outside the cell wall. So what does VX-770 do? According to the CF Foundation, this little blue pill "is designed to allow CFTR proteins located at the cell surface to function correctly and improve the flow of salt and fluids in and out of the cell." 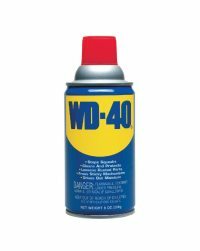 A CF mom on Cystic Life explained: It's "like WD40 to open a rusty gate....the reason G551D is targeted is because their [proteins] are [already in position] and just need help." 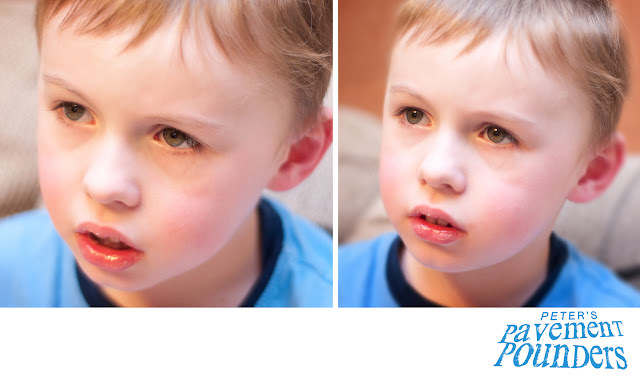 What is the G551D mutation? 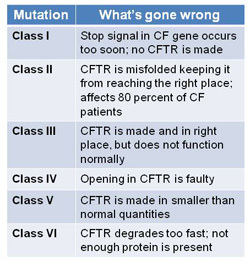 There are lots of different ways that the CFTR protein can be created incorrectly. Each of these different kinds of alterations is called a mutation. G551D is one mutation of CF and is actually quite rare. As mentioned previously, the CFTR protein in people with the G551D mutation is in the right place in the cell membrane, but the gateway doesn't open correctly. That's why VX-770, which opens the "rusty gate," makes such a huge difference to people with the G551D mutation. Our little friend Bryce has this mutation. If VX-770 is passed, he will have a drug that will significantly help his health and increase his lifespan. Yay! 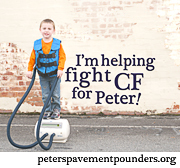 What about Peter and other people with CF that don't have that mutation? The most common mutation of CF is called ΔF508. Peter has two copies of this mutation. In ΔF508, three amino acids are deleted in the CFTR protein. This causes the protein to be shaped the wrong way, so the cell rejects and destroys the protein before it even gets to the cell wall. You might be interested in Amanda's post on the VX-770 trial results. I love how she explains the ΔF508 in light of the VX-770 news: "Like 80% of the CF population, I have a mutation that affects CFTR in a way that it gets labeled as 'trash' before it even tries to go to the cell surface. VX-770 will not work for me…at least not by itself." Good news, though. 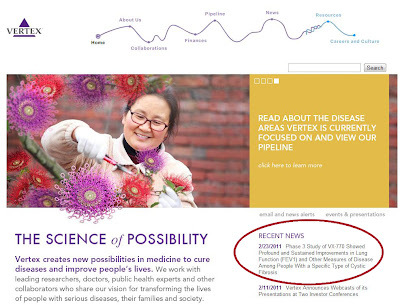 Vertex is working on another medication (in phase 2 clinical trials) that attempts to move the defective ΔF508 protein to the cell wall. Hopefully this drug, called VX-809, in combination with VX-770 may actually make the CF protein work. But for now, we don't know. Ronnie says: "The 770/809 combo is still in Phase 2 testing and it may need to go through multiple phase 2's before even thinking about a phase 3. [Their] best guess was if everything went perfect for the combo, it wouldn't be until 2015 (at the earliest) that we'd see it on market." Is there going to be a cure? 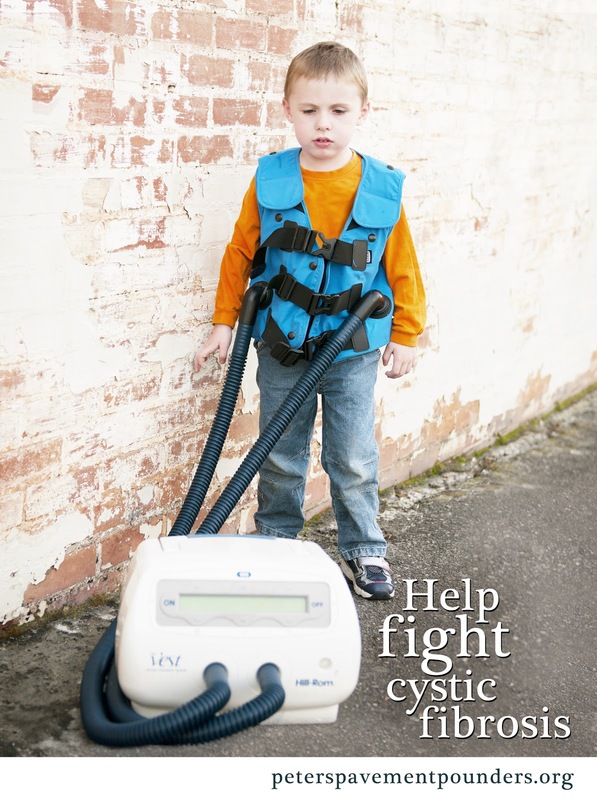 Even if VX-809 and VX-770 work perfectly, people with CF will not be cured. But it may move CF into the direction of being a managed condition instead of a life-threatening disease. To me, that's coming pretty close to a cure. I would love for Peter to be healed entirely from this disease. I think about the miraculous healings recorded in the scriptures and wish that my son and I could have been there. 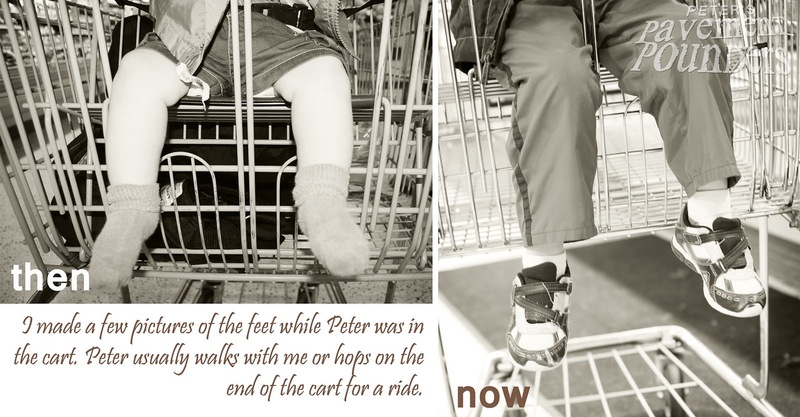 But I have faith that Peter's future holds joy and adventure than we can imagine, and I'm excited for that future--with or without a cure. What? I don't have to sit and coax my child to eat "one more bite" or endure long periods of time at the table so he eats every single thing on his plate? Can I hear a big "woo hoo!" 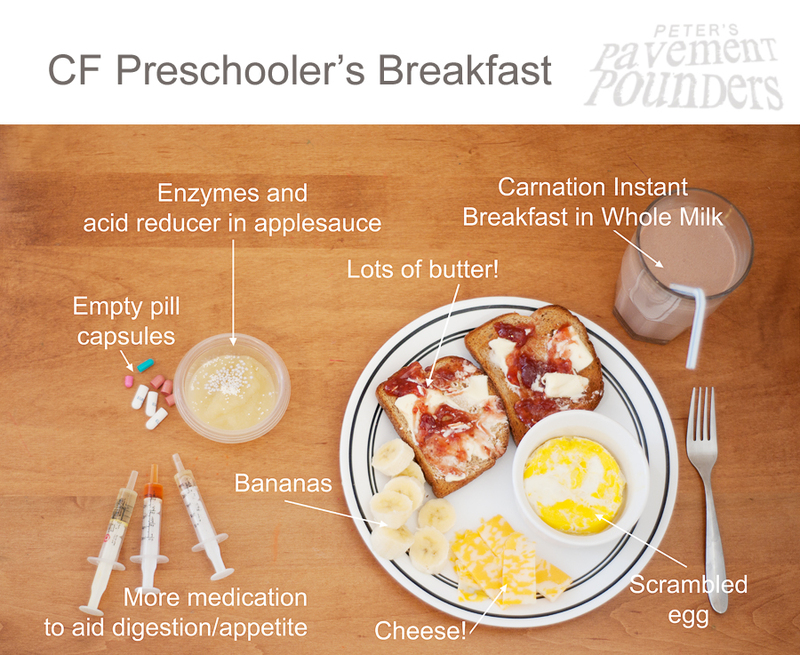 Seriously, I am super excited about the information I learned at the CF Family Education Day, especially since I've started to practice some of the things suggested by Dr. Scott Powers, a behavior and nutrition science expert. Note: Although Dr. Powers was teaching this technique specific to CF children about 2-4 years old, I think it would work for any child that needs to focus on eating/gaining weight. CFers often have trouble maintaining adequate weight and generally have to eat more than healthy children. You can read more about that here. Kids love praise and attention from parents, so use that to your advantage at the table. When they are doing something good, turn that attention on. When they are doing something you don't want, turn the attention off. That's right. No scolding, no prodding, no power struggle (that's attention reinforcing the wrong behavior). By the way, this technique called "Differential Attention." First, make sure all the "courses" are there at the start of the meal -- and make them those high-calorie, high-fat choices. Also, check the clock. Your meal time shouldn't run longer than 15-20 minutes. Sit with the child for the meal, and get rid of distractions: TV, toys, radio, etc. Hopefully you are eating something too! • That's wonderful. I love how you are eating your . . . . (specific food item). • Awesome. You are building strong muscles by eating your food. Show me your muscles! • Wow! That's a big dinosaur bite! • That's two bites in a row! • High Five! You are such a great eater. Ignore them when they are not eating, like when they complain about the food or delay. And--this is the hard one--when they are talking to you or asking a question while they aren't eating. Dr. Powers showed us a video clip demonstrating the technique. When his son wasn't eating, Dr. Powers would turn to the side and not look in his direction. Sometimes this lasted a long minute or so, and his son got quite loud saying, "Dad! Dad!" But, as soon as his son started to eat again, Dr. 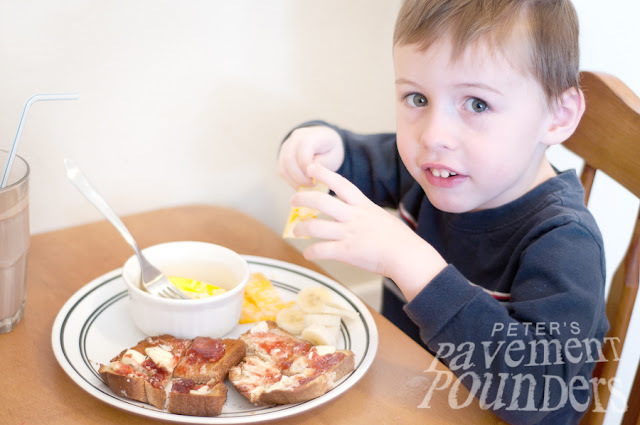 Powers gave a positive, specific, compliment and answered any of the requests that his son had asked him while he wasn't eating. 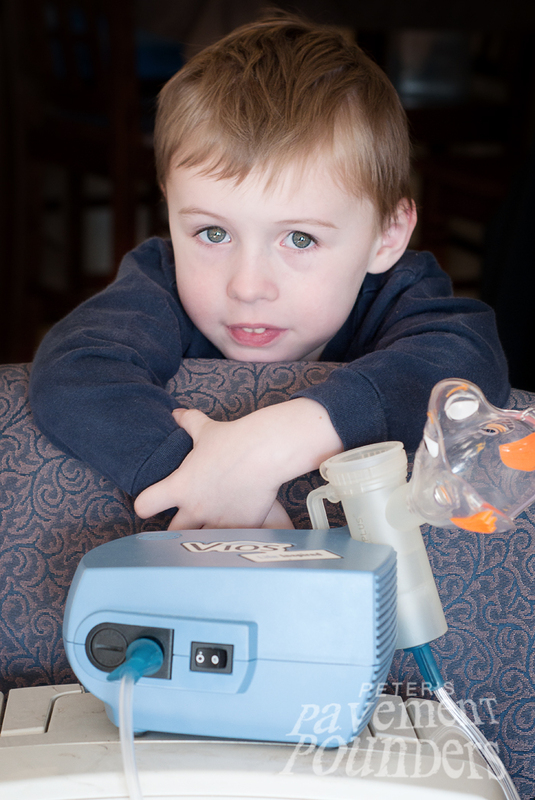 Examining clinical trial results with single-subject analysis: an example involving behavioral and nutrition treatment for young children with cystic fibrosis. Randomized clinical trial of behavioral intervention and nutrition education to improve caloric intake and weight in children with cystic fibrosis. 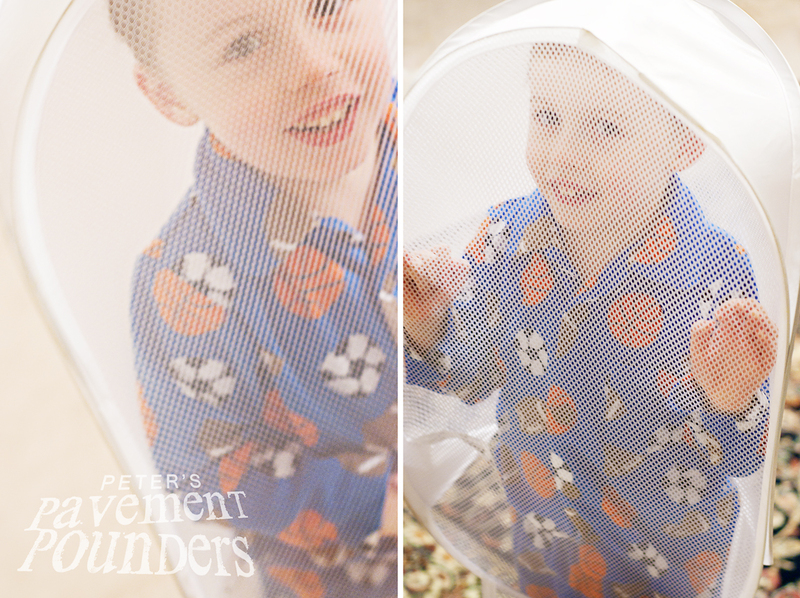 Our meal-time routines have become a lot more fun with these ideas. Medication is an important part of every meal. 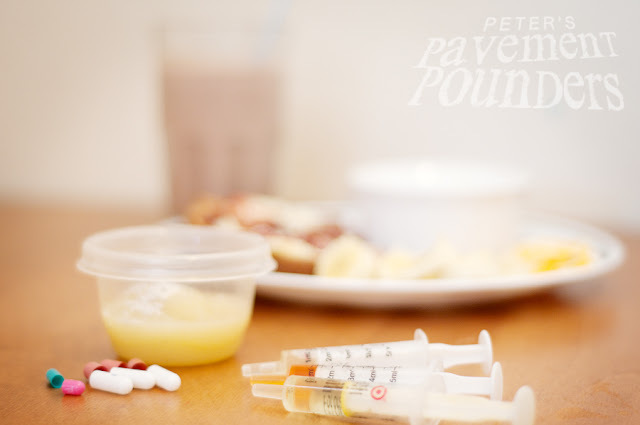 Without medicine, Peter would not be able to digest his food. Restaurant Night -- Many of my fellow CF families have partnered with a local restaurant to do a CF benefit night. Usually, the restaurant donates a portion of the night's proceeds to your walk fund. I've heard that doing a Spirit Night at Chick-Fil-A is a good place to start. Craft/Jewelry Sale -- Some of you love to make crafts, hair accessories, jewelry, cards or other creative items, that's a great way to make some money for your walk fund. Sell them online, in front of a store, or to friends to benefit CF research. Neighborhood Yard Sale -- Gather your friends and neighbors to sell your old stuff for CF. I've been watching Clean House lately, and I'm super pumped about getting rid of my old stuff! Candy/Soda Sale -- How many times do people buy a Coke or Snickers from the vending machine at work or school? Why not sell them at your desk instead and use the proceeds to donate to your walk fund? Coin Drive -- This can be done at stores, classrooms, businesses, or other place where people have out their wallets. Just make a jar and leave it out for people to drop in their donations. You can also have "jar wars" where one class or department competes against another. CureFinders -- The CF Foundation's fundraising program for schools is called CureFinders. More ideas for fundraising at school is available here. Brown Bag Day – Have coworkers bring a bag lunch instead of going out to eat. Then, they can donate what they would have spent at the restaurant to your walk fund. Raffle -- Donors can give a specified donation for a chance to win a gift certificate or other prize. 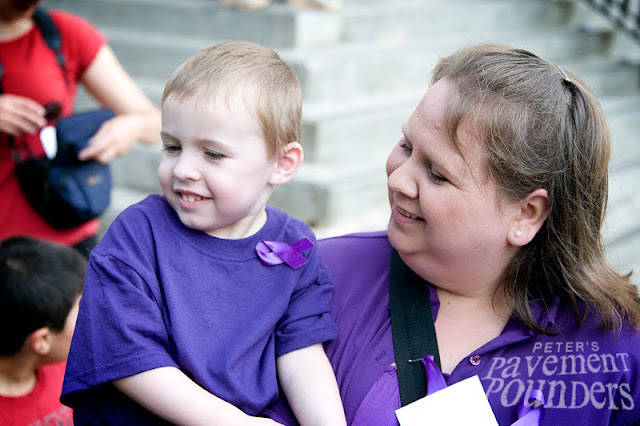 One of my favorite bloggers is Lil' Chris' mom, who is an amazing fundraiser. Here's some of her advice: http://acure4lilchris.blogspot.com/2009/03/advice-on-fundraising.html. 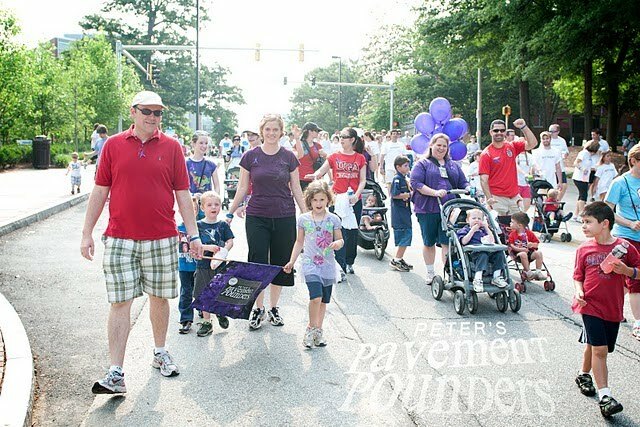 We're sending out the call for walkers for Great Strides 2011! It's free, fun, and easy to sign up for the walk. Please visit the Walk with Us page for more information. If you can't walk with us, please donate to any of the walkers on our teams. I loved personalizing our family's Great Strides pages with video, pictures, and links. Here's a few tips on customizing yours. Of course, you are always welcome to contact us if you need more help on inserting/customizing code for your Great Strides page. Paste the URL (the web address of the link) in between the two quote marks in the code. In between the >< marks, type the text you want to have as the link. 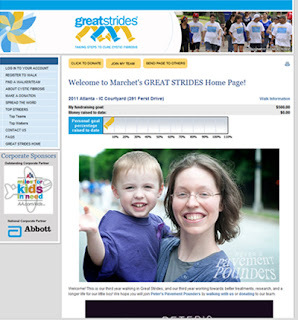 Choose an image from the web that you would like to display on your Great Strides page. Remember to respect copyright and do not use any image you do not have permission to copy. 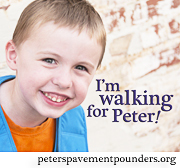 Peter's Pavement Pounders walkers are welcome to use any of the pictures from this site. If you have a picture you would like to use that is not online, you need to upload it to an image hosting site like Picasa or PhotoBucket, then proceed to step 4. Right click on your chosen image and choose "Copy image URL." Paste the image URL (the web address of the image) in between the two quote marks in the code. 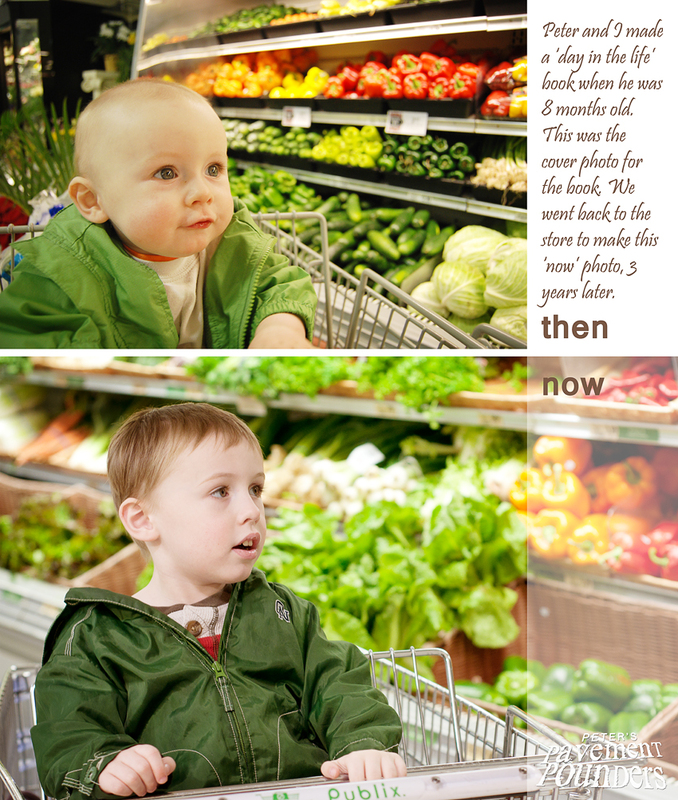 If your image is too wide, you can enter the WIDTH code as you see in the example below. I've found that 640 works well for the Great Strides page layout. 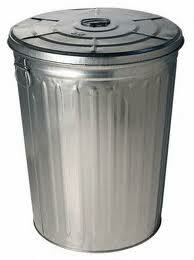 Example: I used this code to insert the following image. This code can be anywhere you want a line break. Hint: Insert two of them for a blank line. Place anything you want to center in between the >< marks. Place anything you want in bold in between the >< marks. Our good friend Megan has created a team for the Mobile/Eastern Shore Alabama walk. We are so excited to have another branch team! We are also excited to have several people walking in memory of Tammy Jo Griffey in the team. Welcome Alabama, and thank you! 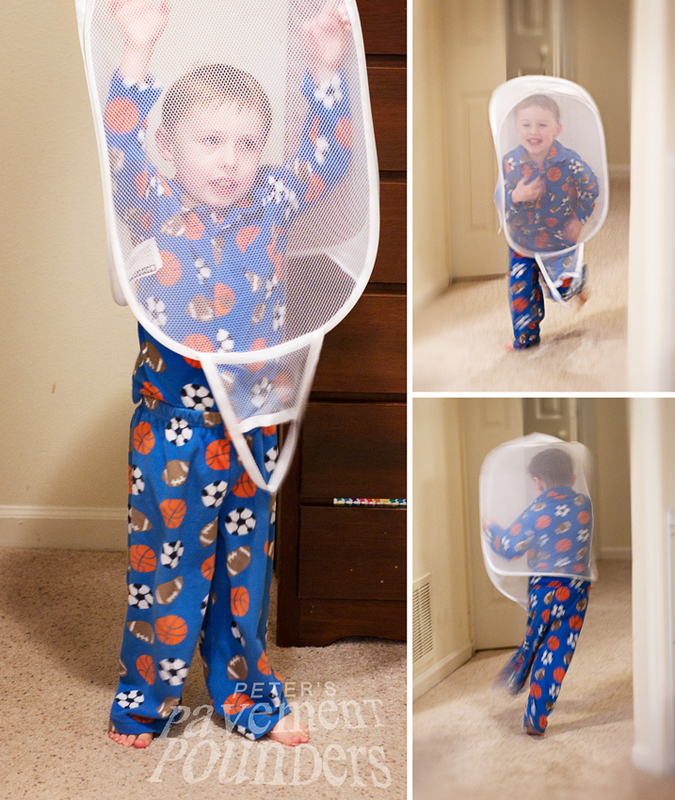 What He Wears: A Basket Costume! I'm so excited to be participating in the Joy of Love photography workshop. Today's topic was "what they wear." 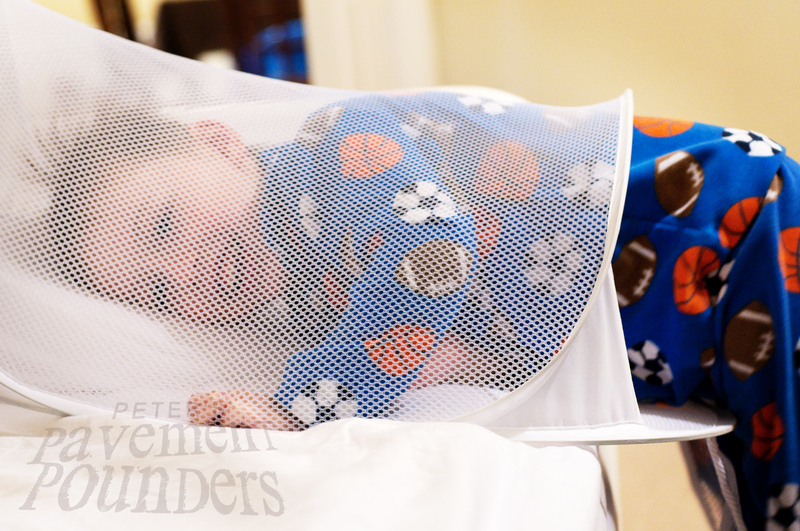 Peter has a favorite game involving a collapsible laundry basket Peter wears as a costume. 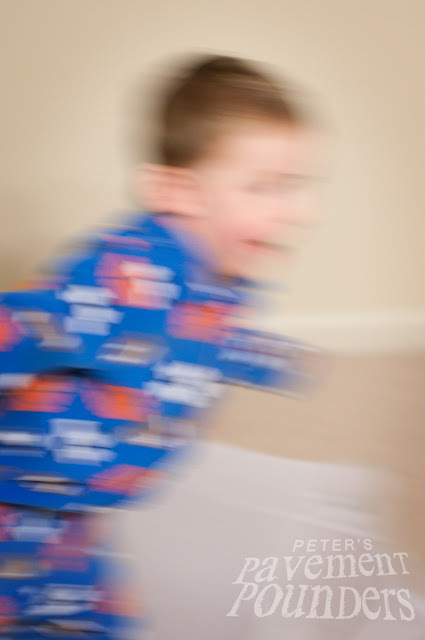 In his "baskume," Peter runs all over our home and says, "boo" and "aaaah!" to scare us. It is deliciously hilarious and so, so cute. Oh, this is my boy! Okay, I'm ready to pray! 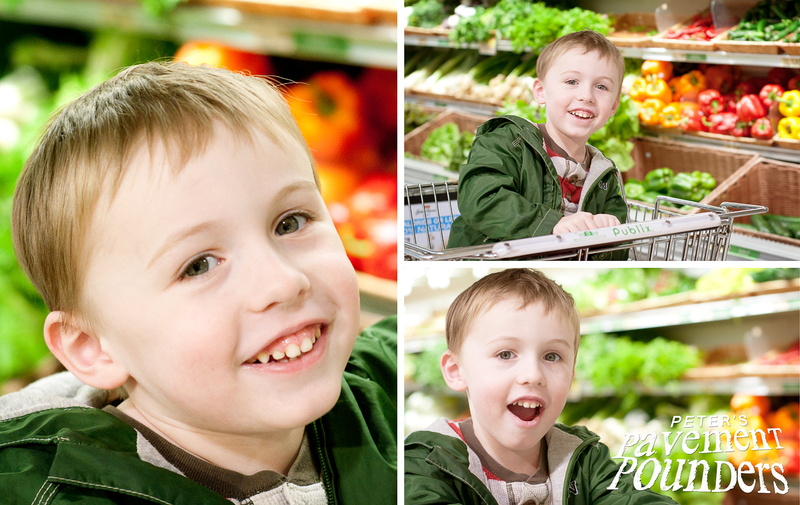 I'm continuing my Joy of Love photography workshop with some photos I originally took just to document life at our home lately. Everyone has gotten sick. Jacob ended up in the ER on Sunday because we couldn't get his temperature down. The doctors decided to call it bronchitis and pumped him full of IV antibiotics and sent him home with several prescriptions. He spent most of Monday and Tuesday in bed. Fortunately, he felt good enough to go to work today. Then, I started feeling stuffy (and it's gotten worse today). Finally, late last night, Peter woke up came down with a fever and cough. These photos are from our late night sick session. At the pediatrician's, the rapid flu test came back positive for influenza A. Grrrr! At least we know what's wrong now, but it's tough to be back on the "sick" boat. Since we all got the flu vaccine, I wondered why we got the flu (assuming that we all have the same thing and the ER people misdiagnosed Jacob). According to the CDC, the 2010-2011 flu vaccine protects against 2009 H1N1, and two other influenza viruses: an H3N2 virus and an influenza B virus. 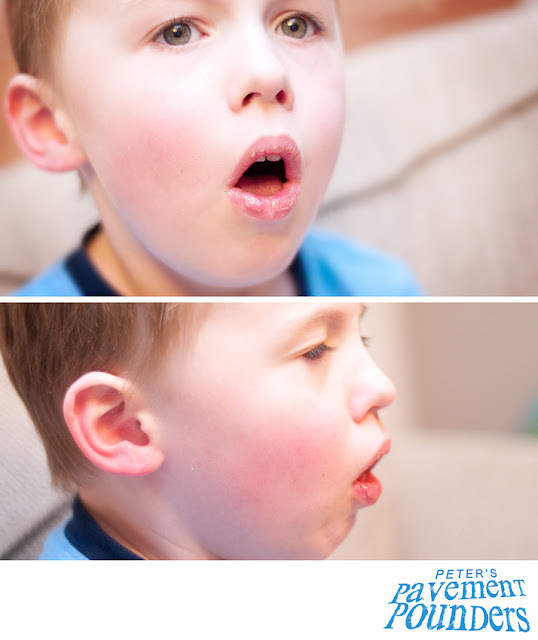 Yeah, no influenza A.
Fortunately, we caught Peter's symptoms early enough, and he is now on Tamiflu. Tamiflu inhibits the reproduction of the virus. That's why it's only effective if you take it within the first 48 hours of symptoms. If you wait until later, the virus has already spread throughout the body. Then, you have to let your body fight it for the duration of the illness -- like for 2 weeks. Uggh. So, Peter might have been the last one sick, but he'll probably be the first one well! Maybe he can take care of me for a change! I signed up for on online photography workshop called The Joy of Love. Vacuum beside me with his little play popper. Wash dishes -- though it's more like playing with his cars and trains in the soap suds. Pour and stir Carnation Instant Breakfast into his whole milk. Peter loves his chocolate milk, and that's great, because it's a great high-calorie supplement to his diet. Clean up his toys before bed each night. Slice and cut (with mommy's help) food for our meals. Here's today's cooking project: cucumbers for salad. I peeled and sliced the cucumbers. Then, Peter cut them up into smaller pieces with his plastic knife. I'm proud to say Peter ate the salad too! 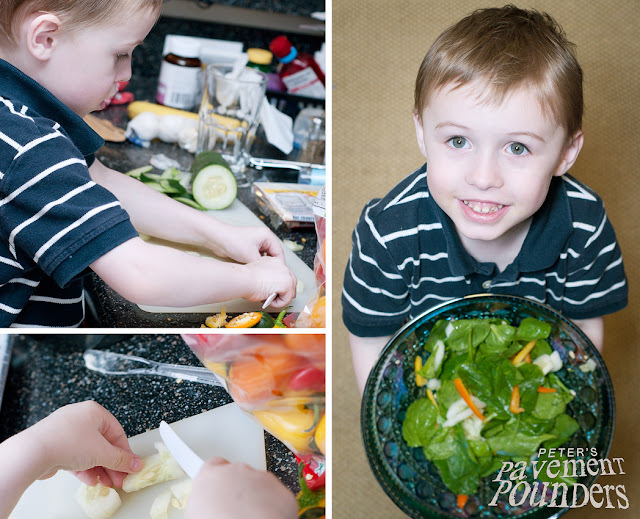 It's so awesome to see my little guy eating veggies (with a high-calorie dressing, of course).